I started making the roasted red pepper dip about 4 years ago. I had just gotten married and was excited to be hosting parties in my new home. The dip, which is so easy to prepare, got rave reviews and soon became my signature dip. 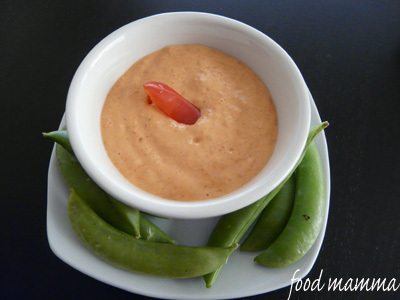 Rarely is there a party at my house without the famous roasted red pepper dip. Served in a red pepper or a simple dish, it is the perfect accompaniment to veggies or grilled crostini. Quarter the red pepper and place on a baking sheet. Drizzle with olive oil, salt and pepper and roast in a 400 degree oven for 15 minutes. At this point, you can remove the skin, but I prefer to leave it on. In a blender, drop in the garlic and blend. Add the red pepper and blend again. Add the mayonnaise and blend a final time. Ready to eat!